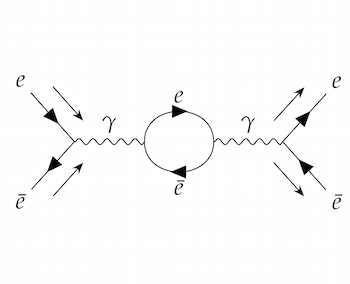 Having written down the equation in the last article, describing the standard model of particle physics (so capturing all the known interactions between all the known fundamental fields), we would now like to make use of it to calculate something about the particles arising in the field. For example, say we want to figure out what happens when an electron ( ) and a positron (the antimatter partner of the electron, written as ) collide. Several things could happen, but let us focus on the case where an electron and a positron emerge after the collision. and apply the rules of quantum mechanics to it. On the face of it, the maths required is simply horrifying. But the brilliant Richard Feynman found a visual way of organising it, the so-called Feynman diagrams (earning him a Nobel Prize in 1965). Photons are drawn as wiggly lines, while electrons and positrons are drawn as a straight line with an arrow showing which way negative electric charge is flowing. The incoming and outgoing particles have an extra arrow next to the line, showing the direction of motion. 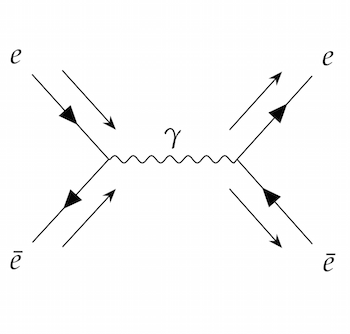 In principle, Feynman diagrams don't depict what is actually happening in the collision; they are just a useful visual shorthand for mathematical expressions. But it is tempting, and useful for your intuition, to interpret them as movies of the collision, with time on the horizontal axis and space on the vertical axis. For example, the first diagram looks like an electron and a positron colliding and turning into a photon, which then turns back into an electron and a positron. 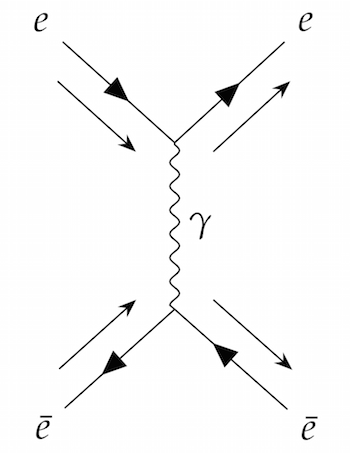 The second diagram looks like the two particles exchanging a photon and then continuing on their merry ways. The third diagram is like the first one, except that the intermediate photon spends some time as an electron-positron pair. Quantum field theory contains a huge number of utterly fascinating details that would take many pages to explain properly. One of the great things about QFT is that it is a very rich subject – starting from its basic principles, you can reach many surprising conclusions. I am just going to give you a quick taste of two of the most important ones: symmetry and zooming. In physics, a symmetry transformation is a change that has no observable effect on the world. For example, if somebody moved the whole Universe a few metres to the left, or rotated it by some amount, this would be completely impossible to detect. Symmetries are a very rich aspect of QFT. For example, the mathematical definition of a charge – like electric charge, or the less well-known hypercharge and isospin – is just a matter of how a field changes in a given symmetry transformation. 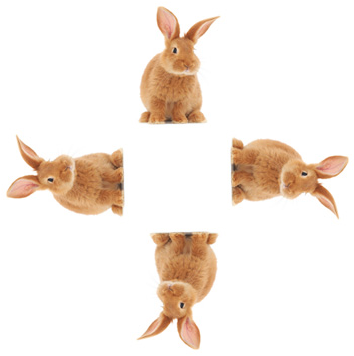 Find out about the last piece of the puzzle in the next article.